Haryana Congress leaders today declared that they would not rest till the Chautala government was ousted, some giving it as many as four months. Pledging to support every struggle of farmers, they said if the President K R Narayanan did not dismiss the government over the killing of eight farmers in the state they would launch a march to Chandigarh. The DRDO has developed first-aid kits to treat nuclear, biological and chemical (NBC) warfare injuries, primarily to augment first-aid resources available with soldiers when speedy evacuation of casualties is not possible. A major fraud in the personal loan scheme, involving bank officials and middlemen, has been unearthed here and has led to the Reserve Bank of India directing all banks to scrutinise the loan cases under the scheme. Culture and Tourism Minister Jagmohan today urged the defence forces to vacate the Red Fort in the walled city so that it could be developed for tourism. The Secretary, Department of Defence Production and Supplies, Mr Subir Dutta, will take over as the next Defence Secretary after Mr Yogendra Narain retires on June 30. The Leader of the Opposition in the Lok Sabha, Mrs Sonia Gandhi, said here yesterday that at a time “when the country is facing daunting problems, it is necessary to spread Bhagwan Mahavir’s message of peace and brotherhood”. She was speaking to a delegation led by Muni Lokprakash Lokesh at her residence. Seemingly alarmed over the prospects of the BSP and the BJP going together in the next Lok Sabha poll, efforts are on by the main opposition Samajwadi Party to unite the anti-BJP forces by forming a “pichra morcha” (backward class front) with the help of the Rashtriya Kranti Party (RKP) and the Apna Dal. Five ministers who had broken away from Manipur state Congress Party (MSCP) and joined the Congress, were today expelled from the primary membership of the party for six years, an MSCP spokesman said. The Congress today got a boost in Manipur when 11 MLAs joined the party. The Mayawati Cabinet today decided to amend the Uttar Pradesh Zamindari Abolition and Land Management Act to provide for stringent punishment for illegal occupants. The Congress today said that it expected the Centre to pay attention to the concerns expressed by the Editors Guild of India and the memoranda submitted by the Delhi Union of Journalists (DUJ) and others expressing apprehension about the openness of trial of arrested journalist Iftikhar Geelani. A 276 km stretch on national highway 1 on the Delhi-Jalandhar section will become a toll road from Sunday midnight. Lok Sabha MP and Akali Dal (Amritsar) President Simranjit Singh Mann arrived here on Thursday with several innovative ideas to woo electorate for the Delhi Sikh Gurdwara Management Committee (DSGMC) elections scheduled on June 30. Following the Supreme Court’s directive, the Centre has convened an all-party meeting on July 8 to discuss the highest court order asking the Election Commission to seek from candidates on affidavit their criminal antecedents. In a landmark judgement, the Appellate Tribunal for forfeited property has ordered the forfeiture of Mumbai-based property of Dawood Ibrahim Sheikh under the Smugglers and Foreign Exchange Manipulators (Forfeiture of Property) Act, (SAFEMA). The Chilka Development Authority (CDA) in Orissa has achieved the distinction of being the first organisation in the entire Asian subcontinent to receive the prestigious Ramsar Wetland Conservation Award for 2002. A woman was trampled to death by a herd of elephants at Choudhargao village Dumka district yesterday. A 35-year-old man has been arrested after the police unearthed an illegal firearms manufacturing unit at his house at Palaspukur village in Murshidabad, the police said today. The Mumbai police steps up security measures following intelligence reports about possible attacks by al Qaida and Lashker-e-Toiba militants. Shopkeepers in Barmer benefit from India mobilising its troops along the border. Thousands of Hindu devotees take a dip in the sacred Ganges in Varanasi on the occasion of the annual Ganga Dasehra festival. At a rally here today to mark the end of 10-day march from Jind where eight persons died in police firing, the Congress leaders said it would live and die with the farmers. 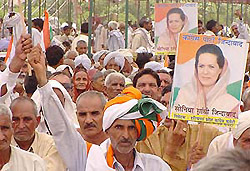 But the perennial infighting in the state Congress manifested itself when former Chief Minister Bhajan Lal was hooted by the large crowd which had come from several districts of Haryana. Mr Bhajan Lal tried to keep his composure as appeals were made by PCC chief Bhupinder Singh Hooda and other senior leaders to the restive crowd to not raise slogans against him. “Muje chinta nahi par yeh achchi baat nahi hai (I am not worried but this is not good),’’ the former Chief Minister told the crowd as he recounted what he had done for farmers in his four-minute speech. “Nobody helped the farmers as much as I did when the problems of flood or drought rocked the state,’’ he said. Signalling “no-no,’’ the crowd, mostly supporters of Mr Hooda, came towards the dias before they were signalled to stop by senior leaders, including AICC General Secretary Mohsina Kidwai who is incharge of Haryana. Later, Mr Bhajan Lal did not accompany the Haryana Congress team which went to the Rashtrapati Bhavan to give a memorandum to President K R Narayanan demanding the dismissal of the Chautala government and a CBI probe into the killing of farmers in police firing. Sources said Mr Mange Ram Gupta, MLA from Jind and a confidant of Mr Bhajan Lal, also did not accompany the team which went to the Rashtrapati Bhavan. Two MLAs close to Mr Bhajan Lal - Chandramohan and Balbir Pal Shah - were not present at the rally. Addressing the rally senior Congress leader Arjun Singh said the Vajpayee government was to be equally blamed for the “atrocities on farmers’’ in Haryana as it was supporting the Chautala government. Delhi Chief Minister Sheila Dixit said her government had given the highest compensation to farmers for their acquired land. Former PCC chief Birender Singh said people had been disillusioned by the two-year rule of Mr Chautala, who had behaved like a dictator. Former Speaker Balram Jakhar, Congress Working Committee member Salman Khursheed, AICC secretary Hanumantha Rao, IYC President Randeep Singh Surjewala said interest of farmers were not safe in the hands of the Chautala government and the BJP-led government at the Centre. The first-aid type ‘A’ kit caters to four to six personnel while type ‘B’ can meet the requirement of 50-60 personnel, an official release said today. The type ‘A’ kit contains necessary medicines, such as inhaler, antibiotics, antipyretic tablets, dressing pads, personnel decontamination kit, three-colour detector paper and amyinitrate durules. The contents of the kit are housed in an aluminium box with shoulder straps for hanging and securing the kit to the body of the soldier. The weight of the kit is 2 kg and its size is 330 mm x 145 mm x 115 mm. Semi-skilled personnel can also use the kit. The management of casualties in chemical warfare environment necessitates augmentation of medical resources. The type ‘B’ kit has been developed to cater to such a situation for immediate treatment by trained medical personnel of chemical warfare casualties at regimental aid posts. The kit consists of all essential medicines, drugs, injectibles, syringes, dressing materials, detector paper and water testing kit. The contents of the kit are housed in an aluminium box compartmentalised into three parts to keep various materials. It can also be used at advanced dressing stations for treating of casualties after decontamination. The kit measures 708 mm x 560 mm x 506 mm and weighs 52 kg. The fraud, which seems like the tip of a big scandal, involves a few crores of rupees. Several banks have been defrauded of several lakhs of rupees as loans under the scheme meant for government and semi-government employees have been provided to many who do not fall in these category, including the jobless, on the basis of forged documents. Middlemen having expertise in forging documents like voters identity cards, ration cards, residential proof and even salary certificates had spread their net in several banks in the Pink City, in connivance with bank officials. Additional Superintendent of Police Rohit Mahajan, who is investigating the scandal, told UNI that the share of middlemen ranged between 20 to 40 per cent of the loan amount and the bank officials also took a major cut. He said the banks had intensified their auditing and internal vigilance and fresh cases were coming up almost every day. Investigations so far had revealed that at least 200 persons had availed loans under the scheme through fraudulent means in this city alone. Mr Mahajan also suspected wider ramification of the fraud, beyond the city. He said it seemed like almost all banks had been defrauded as cases had been reported in the State Bank of India, State Bank of Bikaner and Jaipur, Central Bank of India, Punjab National Bank and Mercantile Bank, besides others. This is also evident from the RBI’s directive to all banks to scrutinise all cases under the personal loan scheme after the exposure of a fraud in Jaipur. The said fraud came to light when officials of the State Bank of India, upon scrutinising a loan case of the Sanganer branch in the city following the non-payment of dues by a nurse, found that the loan had been sanctioned on the basis of forged documents. The bank notices were initially returned as the nurse had given a wrong address and the bank officers lodged a complaint with the police. Following this, the investigation into the non-payment of dues in this single case revealed a major scandal involving bank officials, middlemen and greedy government servants armed with forged documents. Among several persons arrested in this connection are managers of two nationalised banks — S.N. Juneja of the State Bank of Bikaner and Jaipur and Ramgopal Bunkar of the State Bank of India. A case had been registered against Bunkar after it was found that he had helped a nurse Jasmine Samuel to avail the personal loan 19 times. Three nurses were also arrested in this connection. Of the four middlemen arrested so far, one Navin Saxena had established a wide network to forge documents and used to take up to 40 per cent of the loan amount as commission. A senior bank official, who requested anonymity, claimed that some manipulators might have exploited the inherent weakness in the banking system where there was no mechanism to verify the documents submitted by the loanees. Since the scheme was primarily meant for government officials, nobody suspected the genuineness of the departmental letter head or rubber seals. During a raid at Saxena’s house, the police recovered blank letter heads of different departments and corporations and also rubber seals of various government authorities. Saxena was an expert in producing fake documents on demand, be it a voter’s identity card, salary certificate and or even a job certificate. The minister made the demand while addressing ‘Look North’, the first convention of the Northern India Forum for Aviation and Sustainable Tourism (NIFAST), organised by the Institute of Tourism and Future Management Trends. Major-Gen V.S. Badhwar, who is Director General, Resettlement in the Defence Ministry, was among those present on the occasion. Mr Jagmohan said the area behind the Red Fort had already been cleared of all kinds of encroachments and developed as a green area. The area in front of the fort was not being developed in similar manner, he added. He said mindset needed to be changed if tourism had to be used as a tool to remove poverty from the country. Regretting that most of the ambitious schemes tend to ‘flounder on the rock of implementational will’, the minister said there was a need to ensure that the tourists visiting India felt ‘physically refreshed, mentally rejuvenated, culturally enriched, and spiritually elevated’. Mr Jagmohan said it was regrettable that while only around 2.6 million foreign tourists visited India, almost double that number went abroad despite the fact that there were very good places within the country. He said he had himself discovered several unknown tourist destinations since the time he assumed this portfolio. The convention focusing on Punjab and neighbouring states, was addressed among others by Punjab Tourism and Culture Minister Ashwani Sekhri, Punjab Government Secretary B.K. Srivastava, Mrs Malati S. Sinha, who is Secretary in charge of the Indian Systems of Medicine and Health (Health Ministry), and Tourism Ministry Joint Secretary Amitabh Kant. Wellknown filmmaker Deepak Shivdasani, who also addressed the convention, said the film industry should explore the large number of locations within the country instead of going abroad for shooting. He promised all assistance to NIFAST Secretary-General Gulshan Sharma for developing tourism in Punjab and Chandigarh. Earlier, Dr Sharma, Director of the ITFMT demanded an office of the Tourism Department Chandigarh and international facilities at the airport there. Mr Shivdasani wanted the tourism operators to arrange tours for filmmakers to see sites for locations. Mr Srivastava suggested the setting up of an India Interactive Tourism Club with the participation of non-resident Indians to develop tourism and interchange of culture. A press note said today that the Appointments Committee of the Cabinet had approved his name. A 1967 batch West Bengal cadre IAS officer, Mr Dutta has been the Secretary, Defence Production and Supplies, since December 2000. Mr Dutta in his present posting would be succeeded by Mr P.M. Nair, presently the Secretary in the Ministry of Non-Conventional Energy Sources. Among about a dozen appointments cleared are that of P. Shankar as Secretary, Planning Commission, S.S. Dawara as Secretary Ministry of Non-Conventional Energy Sources. The other new appointments cleared are S. Prabhakaran, Special Secretary, Ministry of Power, as Financial Adviser and ex-officio Secretary to the Government of India, concurrently Member, Atomic Energy Commission and Space Commission, M. Shankar, Secretary, Department of Official Language, as Secretary Department of Urban Development, and Pratibha Karan, Managing Director, TRIFED, as Secretary, Ministry of Food Processing Industries. K.K. Jaswal, Additional Secretary and Financial Adviser, Department of Industrial Policy and Promotion, as Secretary, Ministry of Statistics and Programme Implementation, and N.S. Sisodia, Additional Secretary, Cabinet Secretariat, as Special Secretary, Ministry of Power. Vineeta Rai, Additional Secretary, Department of Urban Development, as Special Secretary, Department of Urban Development by upgradation of the post for three months as personal to her, S.K. Tuteja, Development Commissioner for Small-Scale Industries, as Secretary, Department of Official Language and B.K. Misra as Chairman, Staff Selection Commission in the rank and pay of Secretary to the Government of India up to the date of his superannuation as a measure personal to him and on contract thereafter. Searching a mantra to revitalise the party in Uttar Pradesh, the Congress yesterday decided a broad framework for revival which includes more visits by Congress President Sonia Gandhi to the state, developing leadership in districts, organising rallies against the BSP-BJP government and continuing opposition to “casteist and communal’’ forces. Over 160 senior central and state Congress leaders spent almost 10 hours at the AICC discussing the state’s political situation, party’s poor performance in the last Assembly poll and drawbacks in the organisational structure. Almost all those who spoke, including AICC treasurer Motilal Vora who is in charge of the state, laid stress on state leaders working harder in their districts and towns and giving up the tendency of spending time in Delhi and Lucknow. Sources said one of the senior leaders even gave example of the working style of BSP leader Mayawati and Samajwadi leader Mulayam Singh Yadav, who, he said, normally ended up attending more rallies than fixed in their day’s schedule. Sources said Mr Ghulam Nabi Azad, who till recently was in charge of UP, said mere political work by party workers would not suffice and partymen would also have to do social work in the state. He said people should have a positive image of the Congress. There was a suggestion that the party should declare its Lok Sabha candidates now so that they can concentrate in their areas till the actual poll came. No words were minced about the infighting and undercutting in the party, which some leaders pointed out, was one of its main ills. Mr Vora later indicated that the party was finalising an action plan as part of which Mrs Gandhi would tour the state frequently. Leadership camps are also being planned in seven zones of the state and party structure would be revamped by getting more youth from the booth level. The Congress seems inclined not to enter into coalitions in the state and keep its distance from the “casteist and communal’’ forces. Mr Vora ducked question about whether the Congress considered the Samajwadi Party as “casteist,’’ “We will answer that question when the time comes.’’ he said. The meeting of state leaders, held as part of Mrs Gandhi’s efforts to get feedback from party workers in states where Congress is weak, also touched the question of the next PCC chief. Mr Vora said the name would be finalised soon after which the PCC would be recast. The Congress had held a similar meeting of its leaders from Andhra Pradesh. The yesterday’s meeting was attended by AICC general secretaries Mohsina Kidwai, Ambika Soni besides senior UP leaders, including MPs, MLAs, former chief Ministers and PCC chiefs. The leaders from Uttar Pradesh later called on Mrs Gandhi. She announced that she would be taking part in an Ahimsa Yatra being taken out in Ahmedabad under the leadership of Acharya Mahapragya. She said the message of peace and brotherhood being spread by the Acharya was the need of the hour in riot-torn Gujarat. Muni Lokesh said the only way to end violence was to preach non-violence to the people. It was ironic that while crores of rupees was being spent on propagation of violence, there was no concerted effort to spread the values of peace. The delegation, which included Muni Kumud Kumar, Muni Akshay Kumar, Chief Trustee of Akhil Bharatiya Anuvrat Trust K.L. Jain, vice-president of Jain Vishwabharati Sukhraj Sethia and the coordinator of Ahimsa Yatra, Mr Ajay Singh Pundir, presented books written by Acharya Mahapragya and literature relating to the Ahimsa Yatra to Mrs Sonia Gandhi. The SP chief Mulayam Singh Yadav and the RKP President and former U P Chief Minister Kalyan Singh had a meeting here recently to deliberate on forming such a front. The front would aim at consolidating the backward voters, which these leaders claim constitute about 54 per cent of the electorate, Mr Kalyan Singh said. Refusing to outline the exact shape of the proposed front, the former Chief Minister said the modalities for forming the front were still being worked out. Claiming that the proposed front would be able to garner the support of the Backward Classes and the Muslims, he said the BSP-BJP alliance could at best result in the alignment of Dalits and upper castes. A section of the SP, however, apprehend that the party might lose Muslim votes as a result of aligning with Mr Kalyan Singh during whose regime the Babri mosque was demolished at Ayodhya in 1992. Those, who did not ascribe to this thinking, cite the example of Chief Minister Mayawati and say that she continued to get Muslim votes even after joining hands with the BJP. Samajwadi Party supremo Mulayam Singh Yadav said the backward classes were being neglected by the alliance government in the state. He asserted that the proposed front would fight for the interests of the backward classes and expressed confidence that the BSP-BJP combination would be wiped out in the next elections. The decision to expel the members for “anti-party activities” was taken during the party’s Central Executive Committee meeting today morning which was chaired by the MSCP Vice-President, Mr L. Amujao Singh, the spokesman said. He said the party would soon meet the Governor, Mr Ved Marwah, and submit a demand that these ministers be dropped from the ruling Secular Progressive Front (SPF) Ministry because they had been sworn-in as ministers belonging to the MSCP. The five who had left the party and formed MSCP (Secular) before merging with the Congress were the Public Health Minister, Mr Govindas Konthoujam, the Family Welfare Minister, Mr Bijoy Koijam, the Veterinary Minister, Mr Y. Mani Singh, the Minor Irrigation Minister Thangso Baite and the Fisheries Minister, Mr Wungnaoshang Keishing. The decision was announced today after the MLAs met Congress President Sonia Gandhi and were formally inducted into the party. With this the strength of the Congress in the 60-member Assembly has gone up to 31. The Congress, which leads the Secular Progressive Front in Manipur, now has a full majority in the House. The 41-member SPF ministry led by Mr Ibobi Singh in Manipur has 33 ministers. While four of the 11 MLAs belong to the MSCP (Secular), three of them are from NCP (Democratic), and three from Samata Party (Progressive). All these parties are already a part of the SPF and all 11 MLAs are ministers. For early disposal of illegal land encroachment cases, the state government would soon consult the high court to authorise SDMs to hear such cases. Talking to reporters here, Ms Mayawati lamented that while landless labourers had been provided with agricultural land in the past 25 years in the state they had not been able to get its possession. Till now, under Section 198 A of the Act the Assistant Collector was authorised to use force to reclaim the unauthorised occupation. As per today’s Cabinet decision, if the illegal occupant encroaches upon the land again, he would be made to pay compensation to the original owner. “The government should reassure the Editors Guild of India and the DUJ of an open and fair trial and also take all necessary steps that have been demanded by them for ensuring his physical security while in judicial custody,” Congress spokesman Anand Sharma said in the party’s first official reaction since Mr Geelani was arrested. The government would also be expected to meet other demands of the Editors Guild of India about bringing into open all incriminating evidence against Mr Geelani, Mr Sharma added. Demanding a fair and open trial of Mr Geelani, the President of the Editors Guild of India, Mr Hari Jaisingh, had said in a statement that denial of this basic democratic right to Geelani would be a blow to the very concept of the freedom of Press. A notification of the National Highways Authorities of India (NHAI) said that there would be three toll collection plazas one each at Karnal (132 kms), Shambhu (212 kms) and Doraha (296 kms). A differential toll structure has been framed by NHAI for different kinds of vehicles in different stretches of the highway. For instance a car/jeep/van will be charged Rs 50 for the Panipat- Ambala stretch, the toll for which will be collected at Karnal. The same vehicles will have to pay a toll of Rs 30 per vehicle for the Ambala - Khanna stretch and Rs 45 per vehicle for the Khanna-Jalandhar stretch. Light commercial vehicles on the same stretches will be charged Rs 90, Rs 55 and Rs 80 per vehicle, respectively. Trucks and buses will have to pay a toll of Rs 175, Rs 105 and Rs 160, respectively. Heavy construction machinery and earth moving equipment will be charged Rs 375, Rs 225 and Rs 340, respectively, for these stretches. There will be no toll tax for two-wheelers, three-wheelers and agricultural vehicles. For the benefit of those who will be using the road continuously, a monthly pass is available. If elected to power, Mr Mann’s party would set up a Sikh house in the Capital to provide a grievance redressal mechanism for the community around the globe. “The house will be patterned on the lines of an embassy and will serve as a goodwill mission. Sikhs living in any corner of the world can approach us for help. We will get in touch with the embassies concerned, said Mr Mann. Asked if the party has thought of a place to run the house, Mr Mann indicated that they would run it from Gurdwara Rakabganj here. Mr Mann said the party planned to rope in some retired diplomats who would man the main desk at the house to communicate with foreign governments. In its maiden contest in the DSGMC elections, Akali Dal (Amritsar) has fielded 14 candidates for 46 seats. Mr Mann expressed the confidence that the party would win a few seats. A letter from Law Minister Arun Jaitley inviting political parties for a meeting was sent yesterday. The Union Cabinet had discussed the five directives of the Supreme Court to the EC seeking information about the background of the candidates on affidavits on Wednesday. Meanwhile, the Law Ministry has suggested to the EC to seek an extension from the highest court on the July 1 deadline for the implementation of the directives. The Cabinet, sources said, felt that the intention behind the apex court’s judgement was laudable but were a bit impractical as many of the directives were unimplementable since there was no in-built safeguards and adjudication mechanism. In the judgement released today, the tribunal has highlighted the new trend that can be adopted in cases like this where the person concerned does not require any documents evidencing transfer of property in order to hold the property. In this case, Zahoor Islam Sheikh and 15 others Vs Competent Authority ,Mumbai, the appelants are projected as the holders of property to make it appear that they are not “benamidars” or mere name holders while the property actually belongs to Dawood Ibrahim Sheikh. Dawood Ibrahim Sheikh was detained under COFEPOSA in October, 1992. A press note issued here by the Department of Revenue said the Competent Authority, Mumbai, received information from the Directorate of Revenue Intelligence that the property belonged to the detenue and his family members and accordingly SAFEMA proceedings were initiated for the forfeiture of property. The international award instituted by the Ramsar Convention on Wetland is presented once in three years for outstanding achievement in the field of wetland restoration. According to a communication received from Ramsar Convention on Wetland Secretary-General Deimar Biasco, the Ramsar Award and Evian Special Prize for 2002 would be presented to the CDA for its outstanding achievement in the field of restoration and use of wetland. The award, carrying a cash prize of $ 10,000 would be presented to the CDA at the opening ceremony of the eighth meeting of the Ramsar Convention Conference at Valencia in Spain on November 18. The ceremony would be presided over by Crown Prince of Spain H.R.H. Principe Felipe de Bortony Grecia. CDA Chief Executive Ajit Pattnaik said it was established by the government to restore the fragile ecology of the Chilka Lake, the largest brackish water lagoon in Asia, which was shrinking alarmingly. The authority’s other objectives were to conserve the unique bio-diversity of the lake and protect the interests of lakhs of stake holders, depending on the lake to eke out their living. According to the CDA Chief Executive, the Chilka Lake was put into a threatened lake by Ramsar Convention on Wetland in 1993 due to change in ecological character. The lake was almost on the brink of a natural death when the CDA took over the restoration work in 1997. Subdivisional Officer (Sadar) of Dumka Ravindra Sharma said here today that a herd of 13 pachyderms, which had been roaming around in the jungle of the district for the past many months, entered the village yesterday and trampled a 55-year-old woman to death.